We ran into Synek a year or so ago and did an article on them and their new innovative beer brewing system. Now they are gaining momentum, and becoming an impressive force in the industry! They make an incredible device for beer lovers which allows them to have the best quality and best tasting beer from home. They first launched on Kickstarter in 2014, see link kickstarter! 1) A Growler Adapter so you’ll be able to use the dispenser both with the company’s specifically designed bags and with the big glass jugs that bars are more used to filling. 2) Redesigned bags that can hold more pressure. This will help homebrewers who want to carbonate their beer in the bag. 3) A pliable sling for participating bars that will help them distribute beer while introducing less oxygen. They are like the Keurig or Nescafe of beer, allowing folks to enjoy the best at home. We have not tried their beer or device so far, but if given the opportunity to test and review the device we would love to and then we can tell our perceptions of how good it really is compared to other ways of partaking of beer. (ST. LOUIS) After raising $650,000 on Kickstarter and a subsequent $3.1 million in initial funding, SYNEK (“sin-eck”) announces three major product innovations that will further expand the quality and variety of beer to its customers. And their article on Cnet!–Synek Article on Cnet! 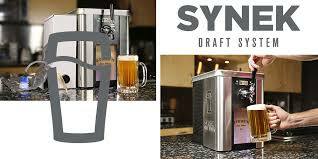 Be the first to comment on "Synek hopes to change the world, at least for Beer Lovers!!"